New for 2010, Dandelion, the eco-friendly baby company, will be introducing a new line of plush toys that shows us a ‘Different Shade of Green’. The new Bamboo Zoo collection, children’s favorite zoo superstars are reinvented with a new posh look fit for the king of the jungle and his fierce friends. 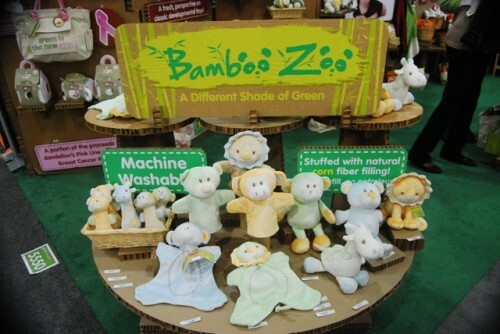 The Bamboo Zoo creations are made from soft and silky bamboo velour and filled with natural corn fiber. Bamboo velour has a natural luster and silky softness, making a crew of charismatic characters shimmer with their own special pizzazz! Bamboo Zoo features Lion, Monkey, Giraffe and Bear, in an adorable assortment of styles and color. Four fun styles: Plush, Puppets, Shakers and Cuddlies in five creamy colors: vanilla bean, pistachio green, orange sherbet, ice blue, and white frost. Expect to see this collection in stores in May.